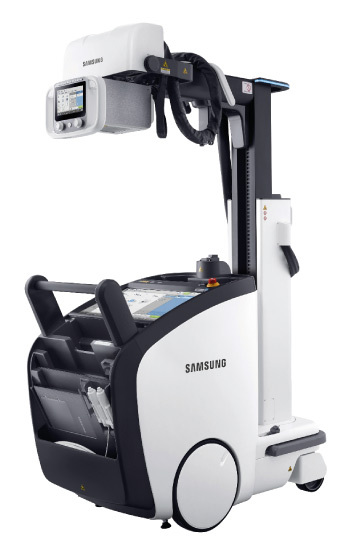 Samsung Electronics' newly launched GM85, a premium mobile digital radiography system, provides advanced mobility, maximized user convenience and a high image quality. Its ultra-compact design with 555mm narrow width and 349kg lightweight allow easy access around tight spaces, even in elevators. When moving the system in the hospital building, GM85's collapsible column gives users clear visibility and help access anywhere easily. The adaptive soft driving control and automatic front bumper sensor offer safe navigation and an ultimate driving experience. The system features a multi-touch screen panel, image display screen on the TH U (Tube Head Unit), and extensive long tube reach for easier operation. The S-Align displays the detector’s angle to the TH U for precise alignment, and the quick-positioning function optimizes workflow and decreases fatigue, enabling users to serve more patients. It can also power up from 0 to 100% in only two to four hours and go on for a full day. The GM85 goes further from this with advanced imaging which enables more accurate and confident diagnosis. It applies Samsung's advanced imaging engine S-Vue to enhance image sharpness and clarity. The SimGrid is an application which, even without the need of a conventional grid, produces superior image by reducing scatter radiation effects. With the SimGrid, radiographers can provide better patient care and lower retake rates, as it eliminates alignment errors that often occur with a conventional grid. The Tube and Line Enhancement feature brings improved clarity of the tube and line in chest images through single on-screen click. At this year’s ECR, Samsung is introducing its latest contrast enhanced ultrasound imaging and presenting the clinical benefits of using CEUS. 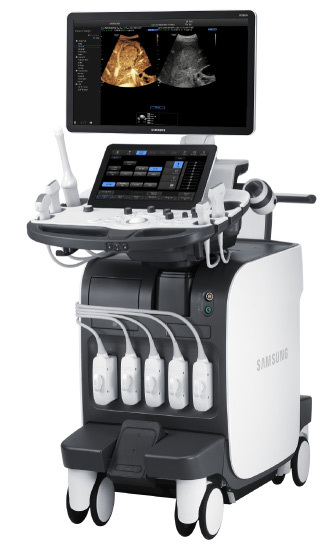 The RS80A with Prestige, Samsung's premium ultrasound system, applies sophisticated imaging technology that empowers user's confident diagnosis. Samsung's CEUS+ provides superb resolution and improved uniformity with effective noise reduction, which help users acquire better clarity in the near field. Its automatic brightness control feature optimizes imaging in real time, enabling users to secure enough time to diagnose. The CEUS+, in particular, improves the diagnosis of small lesions and its clear expression of tissue boundaries helps users to achieve interventional procedures with ease and accuracy. Please visit Samsung’s Satellite Symposium on March 3 from 12:30 to 13:30 p.m. at Studio 2017, First Level, EXPO GALLERY and explore case studies using CEUS+.